How can we understand the impact that mobiles are having on the livelihoods of the poor? We all know that mobile phone use has grown exponentially in developing countries. And that phones are having an increasing impact on the livelihoods of the poor by providing market prices, by supplying health information, by enabling financial transfers, etc. But we know a lot less about how to conceptualise all this. Can we just pull some development studies ideas off-the-shelf? Or do we need to do more than this? A new working paper in the Development Informatics series – “Understanding Mobile Phone Impact on Livelihoods in Developing Countries: A New Research Framework” – argues the livelihoods approach is a good starting point. But that it needs modification. − Asset substitution: saving time and costs for journeys, but adding costs for mobile expenditure. − Asset enhancement: greater efficiency in use of other assets e.g. for agricultural production or relationship-building. − Asset disembodiment: the conversion of assets to digital form e.g. the codification of social contacts, or digitisation of money. − Asset exchange/combination: e.g. the exchange of airtime or m-cash. − Maintaining existing livelihoods and mitigating vulnerability: e.g. use of mobiles to maintain social networks that can assist in an emergency. − Expanding and enhancing existing activities: e.g. using mobiles to obtain greater earnings from existing produce, to save more effectively, or to obtain greater remittances from existing social contacts. − Diversifying into new activities: e.g. employment in the mobile sector, or use of mobiles to complete micro-work tasks. 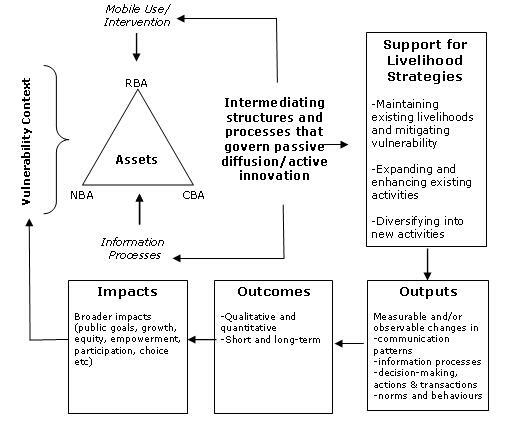 These components of the livelihoods approach – assets, intermediating organisations and institutions, strategies – are therefore very useful in understanding the role of mobiles in development. But the approach also has four shortcomings. − cognitive-based assets (CBA) comprising human and psychological capital including competencies (knowledge, skills, attitudes). ii. Incorporating information. Mobiles expose a truth that information is the lifeblood of development, and yet it is essentially ignored within the livelihoods framework. Information is essential to individuals’ awareness of, and ability to utilise, all assets; and the use of information requires other assets to turn it into decisions and livelihood strategies. Those processes need to be recognised within any understanding of livelihoods. iii. Recognising bottom-up processes. The livelihoods framework tends to see intermediating processes and structures in macro-terms (government, laws, policies, culture). But diffusion and use of mobile has equally been shaped by more bottom-up processes including the functioning of specific market transactions, and user appropriations and adaptations within poor communities. The latter need to be recognised. iv. Categorising impacts. If the core interest is impact of mobiles, the homogenising of that impact into a single “livelihood outcomes” box is not particularly helpful. Better to borrow from the ICT4D value chain and differentiate a broadening scale: from direct changes in behaviour, through process-level outcomes, to broader impacts on development goals. − What is the effect of contextual factors – processes of globalisation, processes of technological innovation, population migration, etc – on the livelihoods impact of mobiles? − How are markets and market processes shaping the impact of mobiles, including the tension between seeking to make markets more inclusive, and markets’ tendency towards exclusion and inequality? − What exactly is the impact of mobiles on the substitution, enhancement/diminution, disembodiment, exchange and combination of livelihood assets at the household level? − Are mobiles forging new forms of connection to the intermediating structures and processes that govern the enactment of livelihood strategies? − What new livelihood strategies are mobiles enabling; how do they come into being and come to sustain; and what impact are they having? − What factors mediate the conversion of mobile behavioural outputs into broader outcomes and development impacts? No doubt there are many other questions that the framework can be used to identify and conceptualise.